A successful 2016 three-month lagoon trial at a large hog producer keeps on giving. It ended last September with a conclusive 42% average sludge-level reduction. You can read the details here. 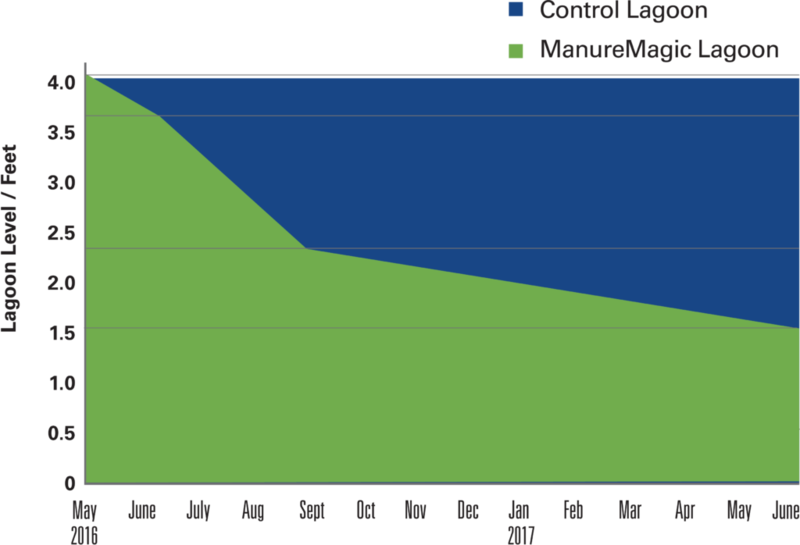 Last week a further 44% drop in average sludge-levels was recorded at the same lagoon, for a 61.6% total reduction since ManureMagic was first applied a year ago. No product has been added to the lagoon since the trial concluded last September. Meanwhile, the pull-plug pits of the four 1,000-head barns that feed into the lagoon have been flushed out weekly on a rotating basis, adding solids to the lagoon. The original control lagoon has remained unchanged. The same customer is currently using ManureManure on a significantly larger lagoon.